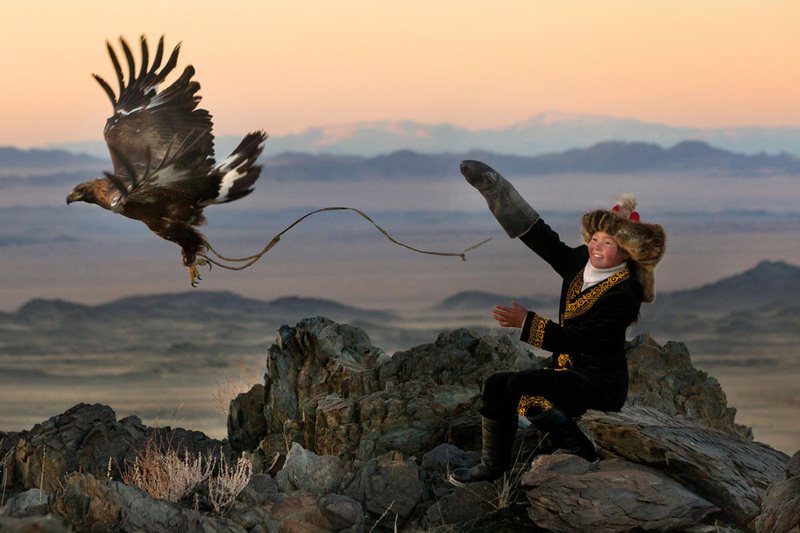 A photographer who witnessed what could be the world’s only girl hunting with a golden eagle – an ancient Mongolian tradition – says watching her in action was a breathtaking sight. Most children, Asher Svidensky has observed, are a little intimidated by golden eagles. Yet Kazakh boys in western Mongolia start learning how to use the huge birds to hunt for foxes and hares at the age of 13, when the eagles sit heavily on their undeveloped arms. Asher, a photographer and travel writer, photographed five boys learning the skill as well as a 13-year-old girl, Ashol-Pan. “To see her with the eagle was amazing,” he recalled. The Kazakhs of the Altai mountain range in western Mongolia are the only people that hunt with golden eagles, and today there are around 400 practicing falconers. Ashol-Pan, the daughter of a particularly celebrated hunter, may well be the country’s only apprentice huntress. The eagles are not bred in captivity, but taken from nests at a young age. Female eaglets are chosen since they grow to a larger size—a large adult might be as heavy as 15 pounds, with a wingspan of over 90 inches. Then, on a spring morning, after years of service, a hunter will release his mature eagle a final time, leaving a butchered sheep on the mountain as a farewell present. “That’s how the Kazakh eagle hunters makes sure that the eagles go back to nature and have their own strong newborns, for the sake of future generations,” Asher said. Asher describes Ashol-Pan as a smiling, sweet and shy girl. His photographs of her engaging in what has been a traditionally male activity for around 2,000 years say something about Mongoliain the 21st Century.